Victoria Street SW1 endured extensive bombing during 1940-1941 and was damaged in the V1 flying bomb campaign of 1944-1945. Victoria Street - redeveloped from 1851 to replace Westminster’s notorious slum housing acres - was lined on either side by high-rise red brick residential buildings and shops. On the very first evening of the London Blitz - 7 September 1940 - the skies above Westminster resounded with enemy aircraft engines. Victoria Street was hit by high explosive bombs at the corner with Vauxhall Bridge Road. Later that night, an open area close to Victoria Railway Station was also damaged and casualties reported. 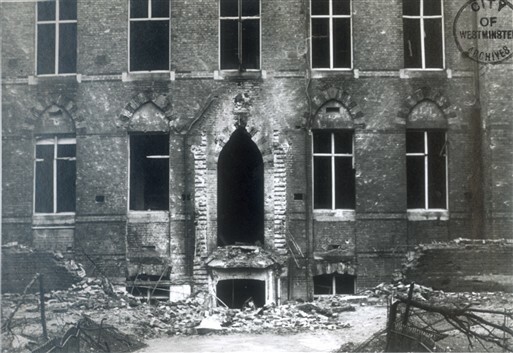 In response to this and later raids, many of the area’s residents sought refuge in local street shelters, in Victoria Underground Station’s tunnels, in the basements of public buildings such as the Army and Navy Stores, in shelters in Christ Church Gardens, Broadway and under Methodist Central Hall, Westminster. 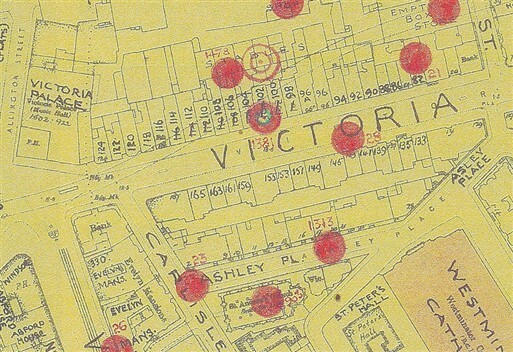 During the Blitz, Victoria Street was hit directly on at least eleven separate occasions. Other streets in the vicinity were struck by high explosive and oil bombs a further nine times, as well as by hundreds of incendiaries. At the western end of Victoria Street, Victoria Station and Victoria Railway Bridge over the Thames were obvious transport targets and suffered accordingly. 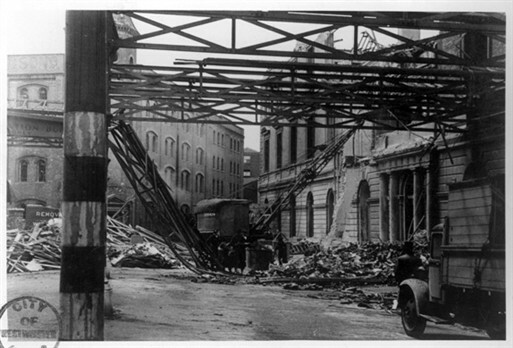 Victoria Station and its locale were hit fifteen times during the Blitz - the first incident occurred late on 8 September 1940 - and bombs fell on both the Railway Bridge and the Station approach, ripping up the tracks. Even so, priority repair efforts ensured that rail operations were only temporarily interrupted. On 15 September 1940, a Luftwaffe Dornier Do17 bomber was brought down by RAF interception over the Station, crashing close to its forecourt. 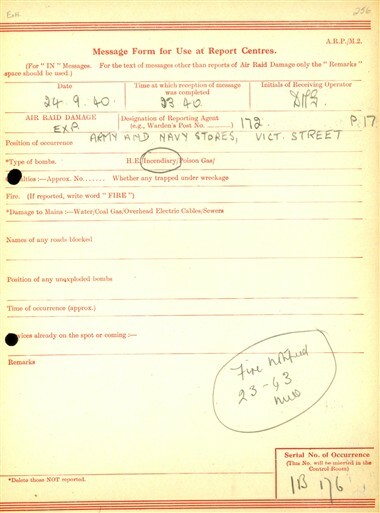 On 11 May 1941, a bomb disposal team dealt with five unexploded bombs dropped on the Station the night before. On 25 June 1944, a V1 flying bomb – one of thirty to hit the City of Westminster during 1944-1945 - struck Hudson’s Place just outside the Station, killing 14 and injuring 82. On 12 November 1944, a V2 rocket exploded prematurely at high altitude over Victoria, but no damage or injuries were caused. 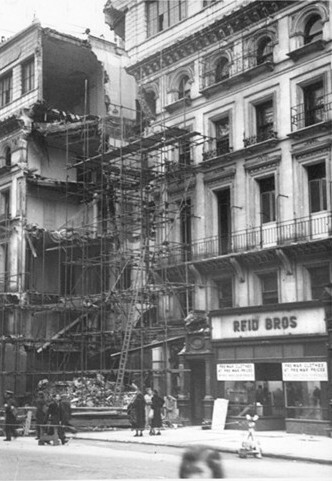 Victoria Street buildings destroyed, badly damaged or burnt out during the Blitz included Christ Church, Broadway (1843) on 17 April 1941, 82 Victoria Street (at the corner with Palace Street) and 102 Victoria Street. 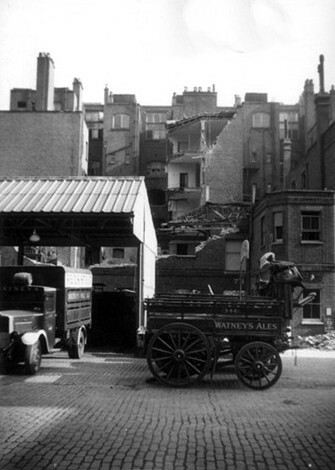 In the night raid of 10-11 May 1941 an engine shop, horse stables, box store and parts of the large Watneys Stag Brewery (on the site of today’s Cardinal Place) were hit and destroyed. 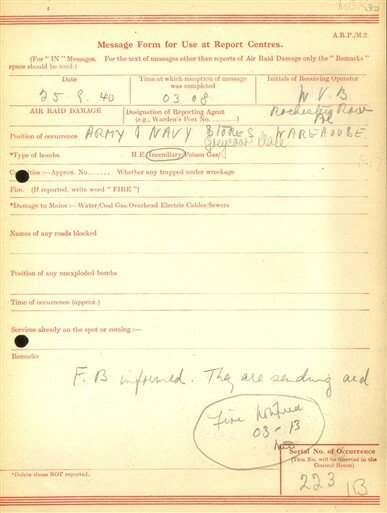 Additional bombs fell on premises next to 125 Victoria Street, on 143 Victoria Street, at 172 Victoria Street (at the corner with Buckingham Palace Road) and on three hotels at 253-259 Vauxhall Bridge Road (10-11 May 1941). 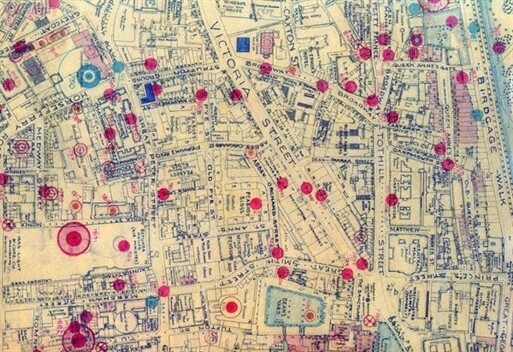 In the immediate vicinity, bombs fell on Carlisle Place, St Andrew's Church in Ashley Place, on ground close to Westminster Cathedral, on 132-142 Ashley Gardens, Westminster City School (Palace Street), Greycoat Place and Old Pye Street. 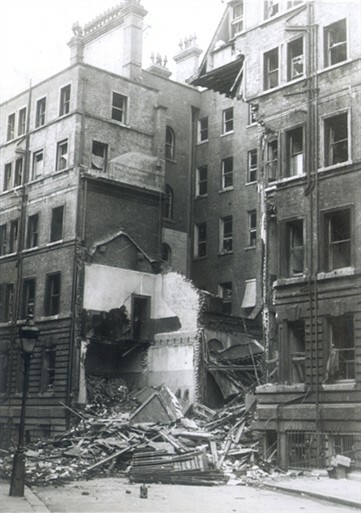 Others hit the roadway opposite the Army and Navy Stores, damaging the 1878 department store at the corner with Artillery Row and wrecking one of its warehouses in Greencoat Place (24-25 September 1940). 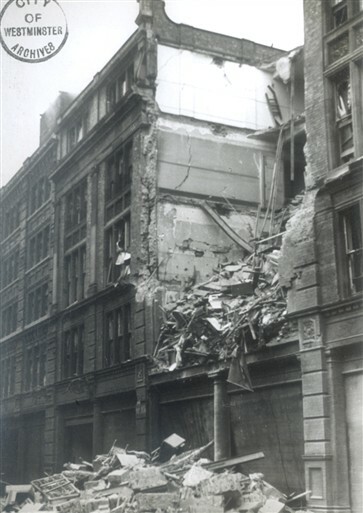 More destruction in the Victoria Street area was caused after direct hits on Queen Anne’s Mansions (today’s Ministry of Justice) on Petty France (13 September 1940) and on Broadway (including London Passenger Transport Board Headquarters at 55 Broadway) on 14 October 1940. At the eastern end of Victoria Street, nos 15-16 Victoria Chambers (on the site of today’s Department for Business, Innovation & Skills) were destroyed, as were St Margaret’s Mansions, 14 Victoria Street (north side) and businesses close to Abbey House, opposite the Sanctuary and the junction with Great Smith Street. Further east still, Westminster Abbey, St Margaret’s Westminster and the Houses of Parliament, potent symbols of British history and identity, were in turn all badly damaged or disfigured by bombing during 1940-1941. At war’s end in 1945, bombsite gaps punctuated Victoria Street’s 19th century residential and business facade (as captured vividly by artist RG Mathews in 1946-1947). Today’s glass-fronted Victoria Street is the result of comprehensive redevelopment from the 1960s and ongoing commercial transformation. This page was added by Ronan Thomas on 11/12/2010.